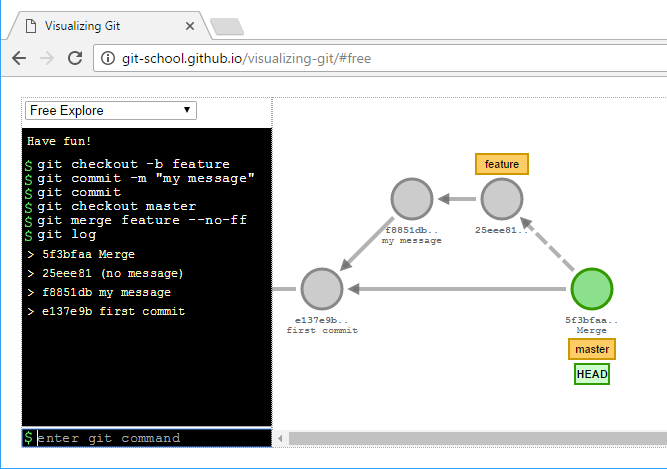 A couple of githubbers (aka those who work at github) put together an interactive visualization of git commands (as an open source project). For whatever reason, being able to play with this particular visualization tool allowed git things to click big-time, which you’ll see more in tomorrow’s tip. “undo” – undoes your last command to the tool. not a git command. But like I said before, just being able to visualize what on earth is happening has been a huge lightbulb moment. They are taking pull requests, so if you know of a good example, why not put together an example demo script for their examples folder? That’s pretty cool, have you seen http://learngitbranching.js.org/ ? ah yes, I have seen it before, but it was a long time ago. The more visualization tools the better since we all learn in different ways!